Para traducir este sitio al español, use Google Translate localizado en la parte de abajo. The I-11 Draft Tier 1 Environmental Impact Statement and Preliminary Section 4(f) Evaluation (Draft Tier 1 EIS) is available for public review and comment. Visit the Public Meetings and Outreach page for more information, including meeting details, Draft Tier 1 EIS document repository locations, and how to comment. In 2015, the Fixing America’s Surface Transportation Act, or FAST Act, formally designated Interstate 11 as a proposed transportation route in Arizona. It stated that the I-11 corridor will generally follow State Route 189 and Interstate 19 from Nogales to Tucson, Interstate 10 from Tucson to Phoenix, and US 93 from Wickenburg to the Nevada state line. The designation doesn’t include funding, but identifies I-11 as a high-priority corridor eligible for federal funding. ADOT continues to work with its federal, state and local partners to identify funding for I-11, which, if constructed, is expected to include a combination of new and existing roadways. ADOT is currently funding and conducting the first step in a tiered environmental study to identify a potential corridor for I-11 between Nogales and Wickenburg. The Tier 1 EIS environmental review process will consider both Build Corridor Alternatives and the No-Build Alternative. For planning purposes, the Build Corridor Alternatives in the Tier 1 EIS are identified as 2,000-foot-wide corridors. However if a Build Alternative is selected, the ultimate I-11 facility would be approximately 400 feet wide. The future I-11 facility would generally be 400 feet wide, which includes travel lanes, shoulders, median, and other possible features like frontage roads. The 2,000-foot wide study corridor for the Tier 1 EIS lays the groundwork for where I-11 would be located. If a Build Alternative is selected, future studies would be required to determine the specific alignment of I-11 within the 2,000-foot-wide corridor. The Tier 1 Environmental Impact Statement (EIS), required by the National Environmental Policy Act (NEPA), is expected to be complete in 2020. If a Build Corridor Alternative is selected, Tier 2 environmental studies would then be required to determine the alignment and specific design details, such as the width of the median, frontage roads, traffic interchange locations, and other roadway features. Currently all but 39 miles of the 200-mile drive from Wickenburg to the Nevada state line have been upgraded to a four-lane divided highway to improve traffic flow, support the movement of freight and enhance safety through this heavily traveled area. The entire northern segment of US 93 from Kingman to the Nevada state line (mileposts 1 to 68) is now a four-lane divided highway following the completion of a $71 million project in 2010. 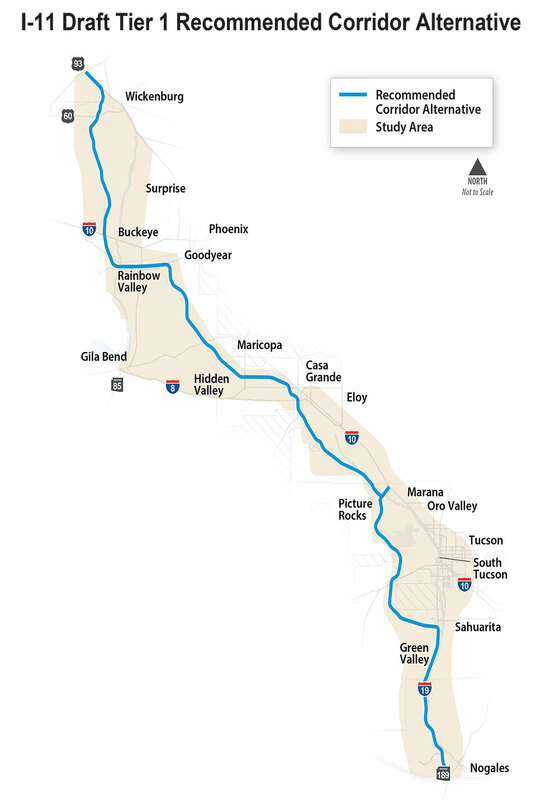 I-11 has been identified as a critical piece of multimodal infrastructure that would support and connect the economies of Arizona and Nevada. It also could be connected to a larger north-south transportation corridor, linking Mexico and Canada. I-11 is intended to provide a high-priority, access-controlled transportation corridor that has the potential to enhance the movement of people and freight, and facilitate regional connectivity, trade, communications and technology in an ever-evolving global marketplace. The Purpose and Need Statement is a fundamental part of the NEPA process, providing the basis for identifying, evaluating and screening corridor alternatives. It will be one of the key components in determining and identifying a Selected Corridor Alternative for I-11. The Purpose and Need is based on key transportation-related problems and issues identified in the previous studies and through agency and public input received during the scoping process. A copy of the Final Purpose and Need report is included on the Documents page. The current ADOT-led Tier 1 EIS builds upon the prior I-11 and Intermountain West Corridor Study (IWCS) completed in 2014, which was a multimodal planning effort that involved ADOT, the Nevada Department of Transportation, Federal Highway Administration, Federal Railroad Administration, Maricopa Association of Governments, Regional Transportation Commission of Southern Nevada, and other key stakeholders. Upon completion of the IWCS study, FHWA and ADOT continued to advance the I-11 Corridor study in Arizona for the approximate 280-mile section between Nogales and Wickenburg, as shown on the corridor study area map. For additional information on the previous study, please visit i11study.com/WC-Study. In December 2015, the U.S. Congress approved the Fixing America’s Surface Transportation (FAST) Act, which is legislation to improve the nation’s surface transportation infrastructure during a five-year period. The FAST Act formally designates I-11 throughout Arizona, reinforcing ADOT’s overall concept for the I-11 Corridor that emerged from the prior IWCS study.